"Innes, go and get me some cheese!" ordered Gregor, a bully of a mouse. "Why do I have to get cheese for you?" Innes asked. "Because if you don’t, I’ll tie your tail in a big knot and hang you from a willow tree. Every cat wandering the glen will want you for his supper," Gregor sneered. Innes gulped. "I’ll find you some cheese," and ran into the woods. "Why do I have to find his cheese? He’s nothing but a big bully," he mumbled. "Where am I going to find cheese around here?" "Who are you talking to?" Elspeth asked. She fluttered her orange wings slowly up and down. Innes looked at the butterfly. "I’m talking to myself. Gregor wants me to find him some cheese. If I don’t, he’ll tie my tail in a knot and hang me from the willow tree so the cats can eat me." "That’s horrible. Who is Gregor?" Elspeth wondered. "He’s a big, fat mouse with gray fur and a long tail, and he’s a big bully too," Innes sighed. "You shouldn’t let him bully you around. Let him get his own cheese," Elspeth said. "He’s much bigger than I am," Innes explained. "I’ll help you," Elspeth told him. "You’re just a butterfly. How can a tiny butterfly fight a big, fat mouse like Gregor?" Innes asked. "I’ve got a plan. First of all, we need to go and find some cheese. I know where we can get some. Follow me," the butterfly said and fluttered away. Innes followed. "If you go into that shed, you’ll find bits of cheese lying on the ground." Innes crept inside. He was nervous that there might be a cat lurking around, but there wasn’t. He grabbed the cheese and ran back outside into the woods. "I’ve got it. It looks very delicious. Can I have a nibble of it?" he asked. "No, Innes; not yet. Now, take the cheese to Gregor," Elspeth said. "But how will that help me?" Innes wondered. "I’m going to go and have a talk with another one of my friends, Archibald. He’s a cat," she said. "I’ll tell him not to hurt you. I’ll tell him about Gregor and what a bully he is. Archibald doesn’t like mice. He prefers to eat cheese," Elspeth giggled. "Oh, I see. It’s a cat that likes cheese, not mice. I’ve never heard of such a thing," Innes scoffed. "Innes, trust me. Do you want to stop Gregor from being a bully, or not?" she asked. "Do as I say. Take the cheese to Gregor and I’ll be there shortly with Archibald. Don’t worry or be scared. He’s a big cat," she assured him. Innes watched as Elspeth fluttered away. He ran with the cheese into the glen. "Gregor, I’ve got your cheese," he shouted. "It’s about time. Give it to me!" Gregor commanded, running out from between some large stones. Innes handed the cheese to the bully. "These aren’t very big pieces. You haven’t been eating any of it, have you?" "What was that?" Gregor asked. "It sounded like a cat," Innes chuckled. Archibald leapt out from behind a tree. He walked closer and closer to Gregor. "Give me the cheese," he meowed. Gregor, horrified with fear, handed the pieces of cheese to the cat. "I hear that you’re a bully and like to pick on Innes," Archibald said, picking Gregor up by the tail. "Don’t eat me. Please, don’t eat me," Gregor begged. 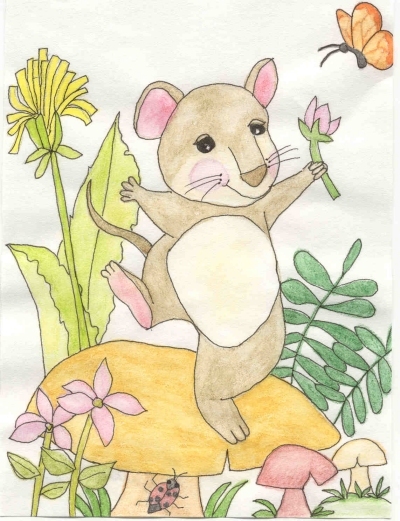 "If you promise to leave Innes and all the other small mice in the glen alone, then I’ll let you go, but if I ever hear of you being a bully again, I’ll come back and gobble you up," Archibald threatened. "I promise," Gregor gulped, feeling relieved. Innes watched from behind a mushroom as Archibald ran to the willow tree with Gregor. "I’m going to teach you a lesson about how it feels to be bullied," Archibald laughed. He took Gregor and tied his tail in a big knot and hung him from a branch of the willow tree. "There, how does it feel?" The cat ran away. Innes could hear his laughter echoing from deep into the woods. Innes ran into the wildflowers, leaving Gregor hanging by his tail. "Hee hee. Innes can’t bully me any more. Thank you, Elspeth," he called to the butterfly. He climbed up on top of a fat mushroom and did a dance of joy. "No more bullies. No more Gregor. Hooray!" From that day on, Gregor found his own cheese and never went near the willow tree again.